1) Create Hash Map for store phone number and messages. 2) Create a receiver i.e. name-AlarmReceiver for sending SMS after every 5 min. 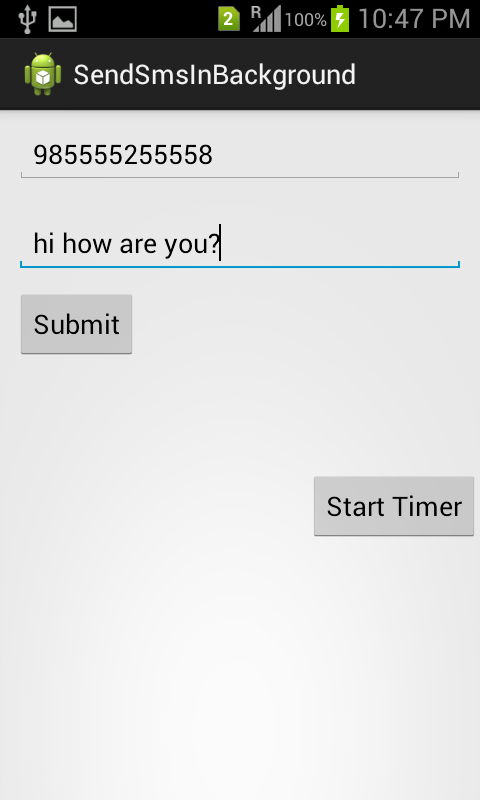 3) Create a AlarmManager which will send SMS after every 5 min. 4) Add <uses-permission android:name="android.permission.SEND_SMS" /> in manifest.xml. Thanks all for your kind support..
linking to next page using spinner items?? suppose if i have 3 spinner items.when i clicked one of the spinner item it should go to next page(activity page).same like remaining two spinner items.how do i do that? onPasswodfailed is an android method? is it working on actual device ?